It’s hard to listen to anyone singing in Quiet Riot these days. No one sounds like the late Kevin DuBrow. DuBrow was a signature voice of his era and genre and is one of the greatest rock singers of all time. Some voices really ARE the band and without that voice you lose quite a bit of magic and appeal. That’s been the case of Quiet Riot ever since DuBrow passed away in 2007. Since that time, drummer Frankie Banali has kept the band alive with bassist Chuck Wright (whose QR contributions date back to the Metal Health era) and guitarist Alex Grossi (whose first outing with the band was in 2004) at his side. Okay, but what about a singer? Yeah, about that… Quiet Riot has run through FIVE singers since DuBrow’s passing. The biggest names being journeyman singer Jizzy Pearl from 2013 to 2016 and the band’s current singer James Durbin. Durbin was previously a contestant on American Idol and released a few solo albums before joining the band in March 2017. In between the tenures of Pearl and Durbin was Seann Nichols. Road Rage was originally recorded with Nichols on vocals, but when he left the band shortly before the album was due to be released, Banali decided to scrap that release and re-record the vocals with Durbin. I’m not sure how much of a hand (if any) Seann Nichols had in the writing of these songs, but it’s my understanding that James Durbin supplied only vocals to an album that was already written and recorded. Didn’t Anthrax and Black Sabbath go through this same sort of thing? I have to admit, I was fully prepared to dislike this album. I was not impressed when the band release “Freak Flag” as a single. I didn’t like the production and I didn’t think Durbin was a good fit. Durbin does not have a powerful voice like DuBrow’s, it is a nasally higher-pitch style that would be better suited for a Motley Crue cover band rather than the actual Quiet Riot. But, hey, at least this album is readily available thanks in part to the band having signed with Frontier Records. 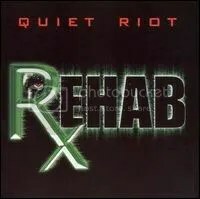 I still have never heard anything from their 2014 digital-only self-release of Quiet Riot 10, which featured Jizzy Pearl in the studio w/ live DuBrow tracks, so I can only compare this album to 2005’s Rehab, which was their last release with DuBrow. Musically, Road Rage isn’t too far off from Rehab. The songs are stripped-down meat & potatoes rock ‘n’ roll with a bluesy influence. They aren’t trying to go for a big ’80s bombastic & polished sound, and that’s for the best. So, after being ready to NOT like this album, once get past the fact that this is Quiet Riot without Kevin DuBrow, the album is actually enjoyable. It’s not going to knock anyone’s socks off, but it’s a solid hard rock album with an old school feel. And while I have no doubt that Durbin’s run with the band will be just as short-lived as everyone else’s, Road Rage is still a decent effort for the band in the post-DuBrow era. Still, with a more appropriate singer, this album could’ve rated higher with me. QR fans aren’t going to love this album, but if they go in with an open mind, they might be okay with it. QR III is actually the band’s 5th album but I guess they aren’t counting their first two albums that were released only in Japan in the late 1970s. I tend to think of Quiet Riot just as I think of Twisted Sister: both were solid metal bands, both had singers with powerful voices and both bands had great commercial success fairly early and then saw those sales fizzle out pretty quickly with each subsequent release. Also, when the going got tough, both bands tried using a much lighter sound in an attempt to stay commercially relevant (it still didn’t help). Well, like I said, after the multiple platinum success of Metal Health and the disappointed of Critical Condition (it “only” went platinum), the band went with much lighter and more commercial sound in order to increase sales. This new synthesizer-heavy/AOR sound is none more apparent than on the opening track, “Main Attraction”. The first notes you hear on this album are not provided by guitar, drums or even by a bass guitar but by keyboard! The song is actually a great piece of cheesy pop-metal but I can imagine that it did the band no favors with all of the fans that bought Metal Health back in ’83. “The Wild and The Young” is a more like the Quiet Riot of old but then “Twilight Hotel” moves back into AOR territory and sounds nothing like the band at all. “Still of the Night” is another slow melodic rock number that makes you wonder how this is Quiet Riot, but I think it’s another excellent song. “Slave to Love” is another AOR-style song but again, I like it, though I will admit the female vocals really seem out of place on a QR song! “Bass Case” is a cool bass instrumental performed by Chuck Wright. Rudy Sarzo, the band’s bassist from the “classic” line-up had left the band in early 1985 after growing tired of Kevin DuBrow’s ego & attitude. “Put Up or Shut Up” is a rocker that could’ve fit in on the two previous albums while “Down and Dirty” and “Rise Or Fall” could’ve been two really good hard songs but they are cut off at the knees by synthesizers and an overly polished production. There is one song on this album (“The Wild and The Young”) that I would put up there with the rest of Quiet Riot’s signature songs. The rest is good, cheesy ’80s melodic rock. It’s not what anyone expected or wanted from this band and sure you could throw the “sell out” label on them for releasing these songs but I find QR III to be a guilty pleasure melodic rock album. The album probably deserves another look from people who stuck their nose up at it the first time around. I was really surprised by how good this album was when I picked it up. After hearing about how bad most QR albums had been post-Condition Critical, I wasn’t sure what to expect. I had read many interviews leading up to this from Kevin DuBrow and Frankie Banali talking about the strong 70s rock influence on this album and they were right! They consciously avoid doing any type of party-metal anthems they made it big on and deliver a solid platter of classic sounding hard rock. The 1970s influence is especially apparent on “Old Habits Die Hard” and obviously, the Spooky Tooth cover “Evil Woman”, which features a great duet between DuBrow and Glenn Hughes (who also co-wrote a few songs). Kevin’s voice, by the way, is as strong as ever throughout the whole album. He’s always been one of my favorite rock vocalists and matches his early 80s performances here. Interesting to note that guitarist Neil Citron and bassist Tony Franklin played on the album, but soon after recording, both were out of the band and never played one of these songs live! They were replaced by returning QR members guitarist Alex Grossi (originally played with QR 2004-2005) and QR’s “Fifth Beatle”, bassist Chuck Wright (who has joined & exited the band numerous times since 1982). First, the rest of the classic QR line-up, Rudy Sarzo and Carlos Cavazo, were not involved in this project (and hadn’t been involved with the band for a number of years). More important and tragic than that though is the passing of Kevin DuBrow on November 25, 2007, of an apparent accidental cocaine overdose. 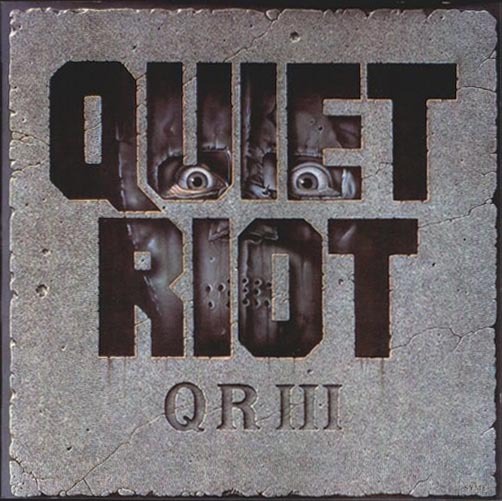 It makes the title of this album, the final Quiet Riot album, pretty creepy and sad. With the passing of Kevin, the music world lost a great champion of rock and a great rock ‘n’ roll band. Quiet Riot was never going to have a hit album or single again, but they proved with Rehab they were still relevant to the hard rock scene, with a release that is almost universally accepted as being right behind Metal Health in their catalog, and I was hoping to hear many more new albums from them for years to come.